Serve the rice as a side dish with meat and veggies, in bowls, burritos, tacos or wraps. Here are a few ideas! 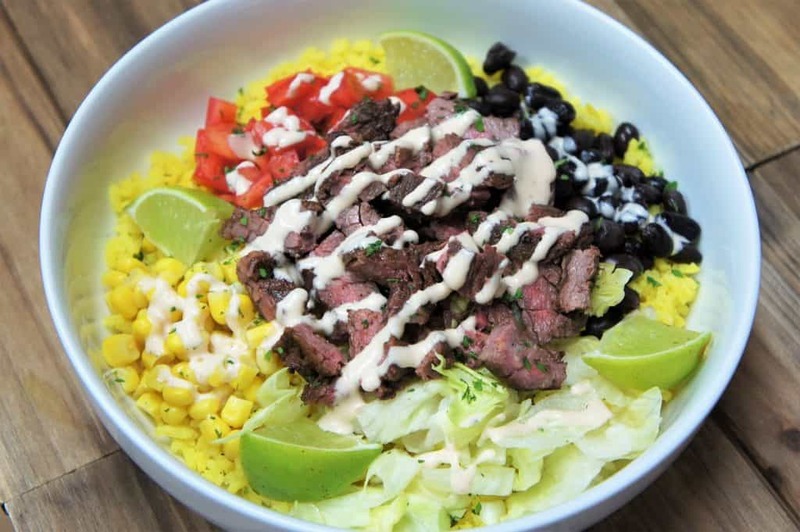 This Southwestern steak bowl starts with a bed of yellow rice. The rice is topped with lettuce, tomatoes, corn and black beans. Then it’s topped with perfectly seasoned grilled steak. The finishing touch is an easy to make chipotle ranch dressing. 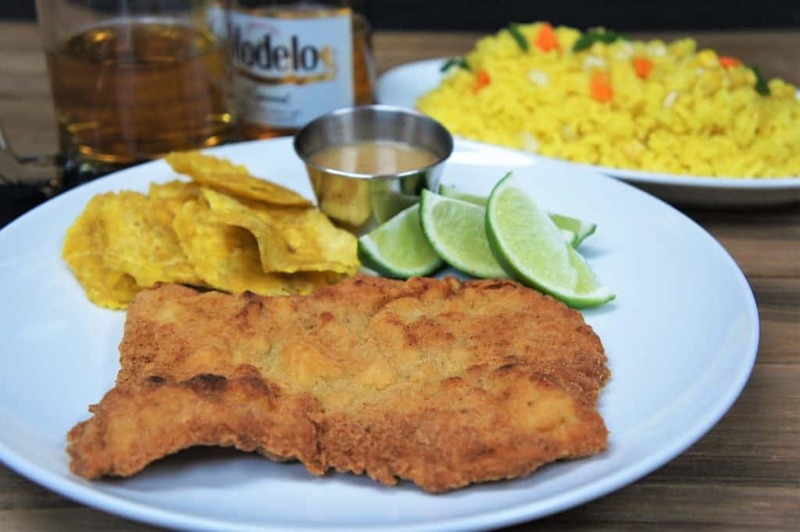 Here, yellow rice is served with a Cuban style breaded pork steak and a side of plantain chips. 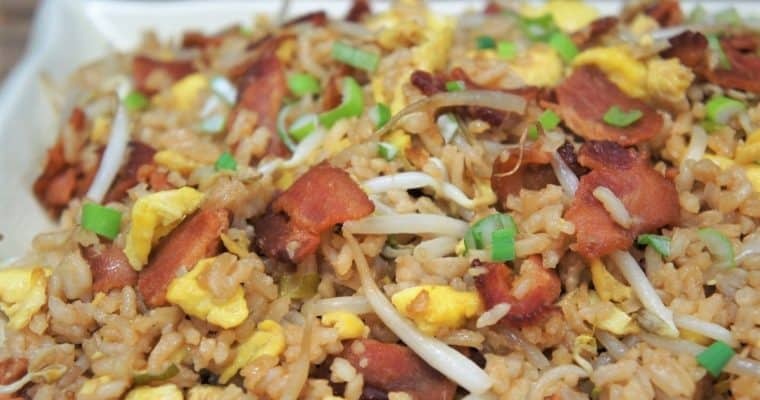 To switch this up, we top the yellow rice with mixed veggies, which is absolutely delicious. This spicy baked chicken is bone-in, skin-on chicken thighs and drums that are seasoned with blackened seasoning, soy sauce and chopped parsley. 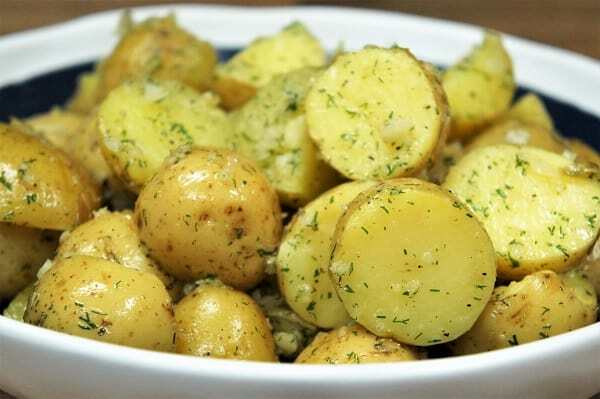 Then they’re baked until juicy and flavorful. 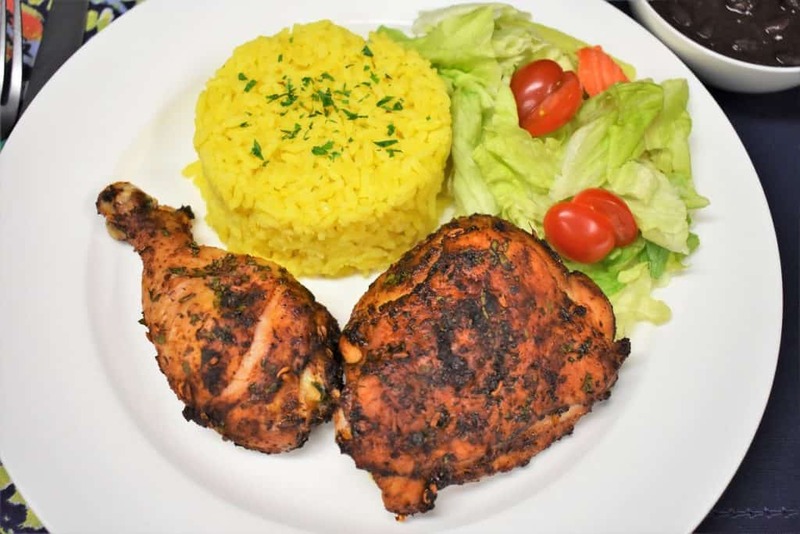 The chicken is served with a side salad and the yellow rice. Bring the water to a boil in a medium saucepan. Add the chicken base, minced dehydrated onion and turmeric. 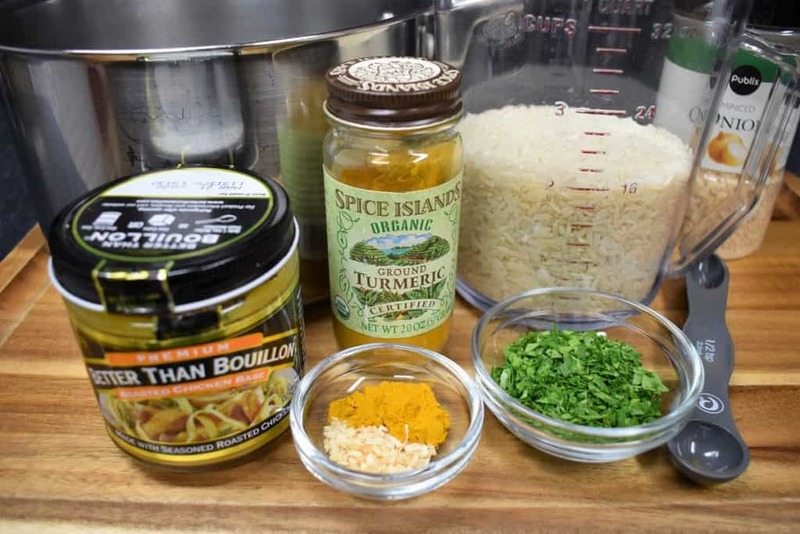 Stir well to dissolve the bouillon and combine the ingredients. Add the rice to the saucepan, lower the heat to medium and stir well. Continue simmering the rice, uncovered, until most of the water has cooked out. The rice should be visible on the surface, about 10-12 minutes. Give the rice another quick stir, lower the heat to low and cover. 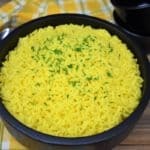 Cook the yellow rice for about 25 minutes, or until done. It’s easy to make this dish vegetarian. Replace the chicken base with a vegetable base, Better than Bouillon makes a vegetable base too, as do other brands. If you’d like to check out more easy and tasty side dishes, try these green beans and bacon, or this family favorite broccoli and cheese casserole. Enjoy! 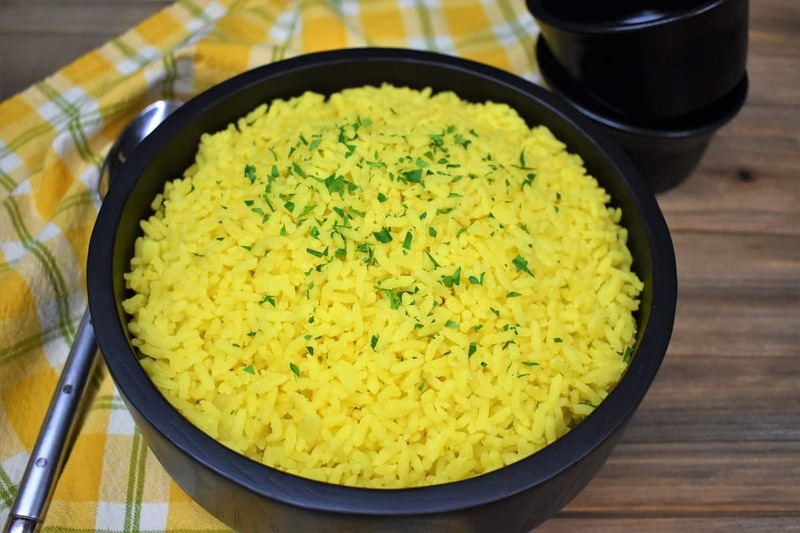 Making yellow rice at home is really as simple as making white rice. 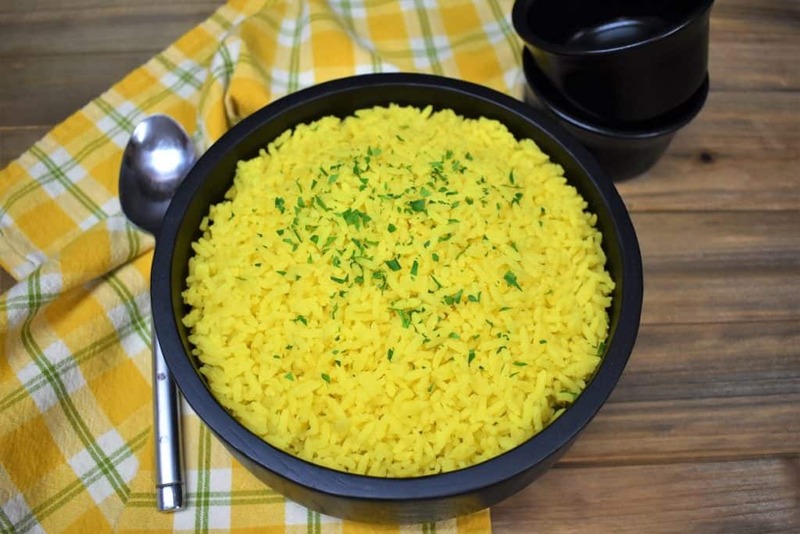 This yellow rice gets its beautiful color from good-for-you turmeric. Give the rice another quick stir, lower the heat to low and cover. 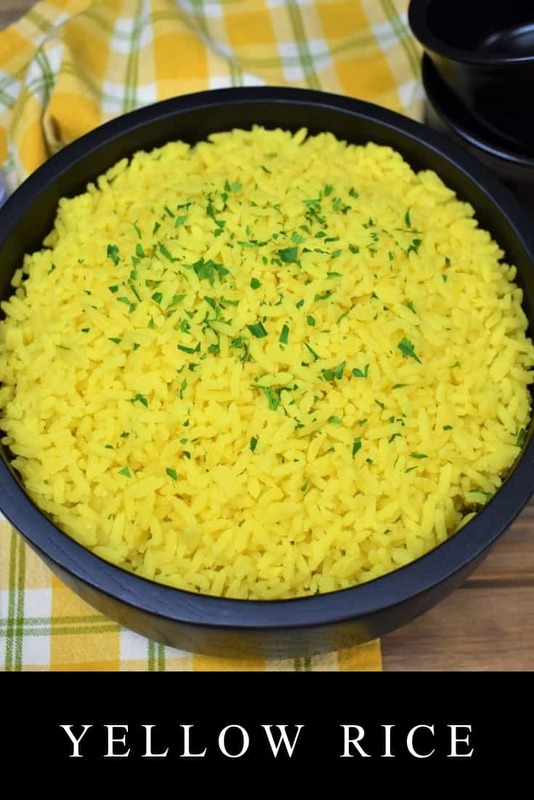 Cook the yellow rice for about 25 minutes, or until done.